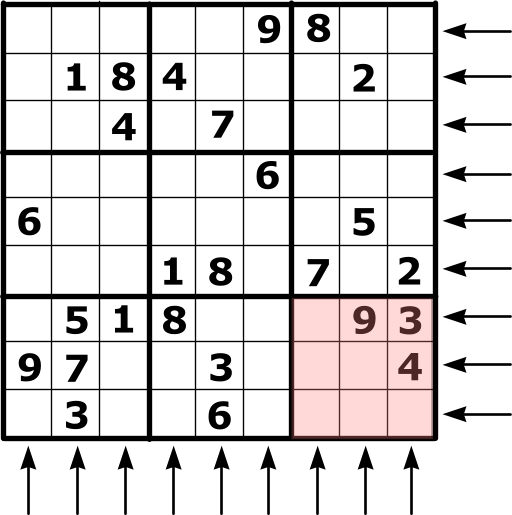 Sudoku is mostly seen as a number puzzle in newspapers. It’s basically a logic puzzle and has nothing to do with math. That’s important to understand as I’ve asked many people if they solve Sudoku puzzles and the almost universal answer when they say “no” is because they are not good in math. It has nothing to do with math! You have nine containers in a 3×3 array and each container has nine squares also in a 3×3 array. This gives a puzzle that is a 9×9 square array. When shown in the newspaper some of the squares are filled in with numbers. It’s your job to fill in the rest according to the rules. The rules are quite simple. When done, each square must have a number in it. Each row, each column, and each container must have the numbers one through nine in them with no repeats. Let’s see what that looks like. The no repeat rule is really unneeded because if you have one to nine in each row, column, and container then there can be no repeats. So, that leads to an important point: every puzzle has one, and one only, unique solution. OK, now you know the rules and know that there is no math involved, how do you solve the Sudoku puzzle? We’ll take the puzzle above through to a solution over several posts. In the next in the series, we’ll see how to get started by filling in the squares that are essentially gimmies. See if you can guess how and then come back and check your answer. How to fill in the gimmies. More advanced logic to continue the solution. The end game and final solution.